Fish oil side effects are most often tied to the levels of toxic pollutants and contaminants (such as mercury) that may also be present in certain fish. These pollutants, called polychlorinated biphenyl compounds (PCBs), have been linked to cancer, and have been known to cause various skin, liver, and stomach problems when consumed in high concentrations. On some rare occasions, high doses of fish oil can cause the opposite effect of that for which they were intended. In other words, taking fish oil as a remedy for depression or bipolar disorder (for which it is occasionally prescribed) may actually increase the symptoms of those diseases. Those who experience any of these augmented symptoms should discontinue any further ingestion of fish oil in any form. Side effects are generally the same within men and women. However, pregnant women and women who are breastfeeding should be particularly cautious when ingesting fish oil in any form. It is difficult to determine the particular concentrating of toxins that may be contained within fish oil supplements or in a serving of any oily fish, and not enough is known about the effects of fish oil during pregnancy and breastfeeding. Because mercury contaminants may be especially harmful to the fetus or the infant, pregnant and breastfeeding women should try to avoid these oils. The side effects of fish oil rarely include weight increases or decreases. Some people who ingest very high doses of fish oil may experience some minimal weight gain, since fish oil itself is made up mostly of fatty acids that may be difficult for the body to metabolize. This can be beneficial in certain cases, however, as taking a fish oil supplement has been shown to reduce the rapid weight loss associated with cancer and other physically deteriorating diseases. Interestingly, some studies have linked fish oil to weight loss as well (especially when used in conjunction with a good diet and exercise), but these studies are largely inconclusive. Fish oil may react negatively with certain other prescription drugs. For example, when taken in conjunction with birth control medication, the efficacy of fish oil may be decreased. Additionally, those taking medication for high blood pressure may want to avoid fish oil, as it may cause blood pressure to dip down to dangerously low levels. Individuals on blood thinners like warfarin or heparin should also avoid fish oil, which has been shown to have anticoagulant properties, and may therefore increase bruising and bleeding when taken along with other thinning agents. Pregnant women, small children, and those with fish allergies are generally advised to avoid fish oil. 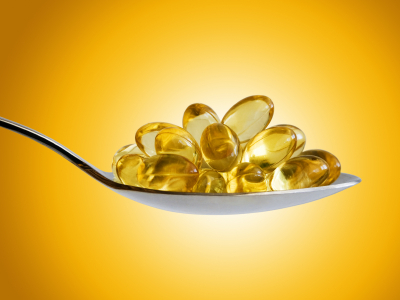 Aside from these cases, fish oil is safe for consumption and has many health benefits. Still, it is important that each consumer carefully read the label on any fish oil supplement to ensure that the product is free of PCBs and contaminants. It is also best to purchase supplements made from fish like mackerel and anchovies, which are less likely to absorb large levels of toxins from other fish.